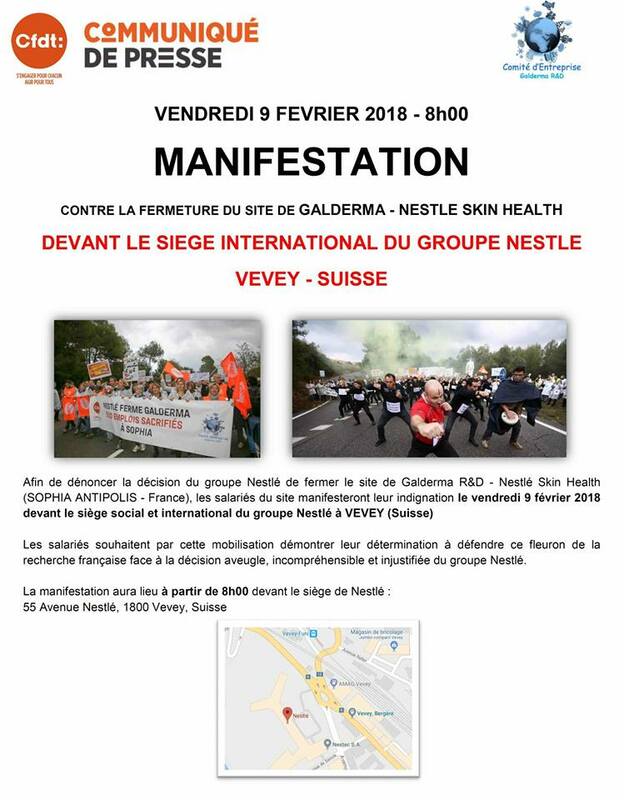 Some 200 workers from the Nestlé-Galderma research center near Nice in the south of France are travelling overnight for a demonstration at Nestlé headquarters in Vevey, Switzerland on 9 February, to show their anger over Nestlé's announced intention to close the center. In September 2017, Nestlé announced a "strategic reorientation" of its dermatology division, Galderma, leading to the announcement of the closure of the R&D center which employs some 500 people. For their trade union, the FCE-CFDT, "Nestlé's decision to close the largest research center dedicated to dermatology in Europe and to open a new R&D center in Switzerland is incoherent, incomprehensible and unacceptable." The IUF-affiliated FGA-CFDT, which represents Nestlé food workers in France, has been supporting their sisters and brothers at Nestlé-Galderma in this conflict. They will be on hand for the demonstration along with representatives from the IUF, on behalf of Nestlé workers world-wide.